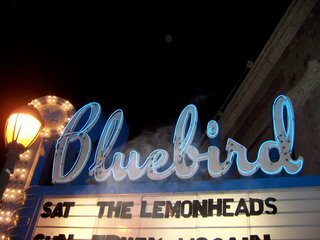 Somehow in my 12+ years of fandom, I'd never made it to see Evan Dando and Co. in concert before Saturday night's show with "The Lemonheads" at the Bluebird Theatre in Denver. There was a deep sense of goodness & nostalgia permeating the show, which I was more excited about than any show I've seen recently. The warm and golden voice of Evan Dando soundtracks many many good memories for me, and I've loved him from his early days of alternative poster-boyhood (with the flowing long hair), through his Oasis/party hearty/crack cocaine days (though I was with you on that 'what're you doin' man?' train of thought), the solo albums, on up to this year with the fantastic new Lemonheads album. On a freeeezing Saturday night, the venue was intimate, the setlist fabulously varied, and Dando was still rocking the stoner-sailor look with a striped long-sleeved shirt, although a bit older (aren't we all?). The crowd was a mix of reminiscing fans in their 30s-40s and beyond, some barely 21-plus who probably were playing kickball on the blacktop when It's A Shame About Ray came out, and the same enthusiastic Japanese girl from the Ben Kweller show a few months ago who brought presents for the performers and pom poms for cheering. Check out some video: the stage was quite dark so photos didn't turn out too hot. MORE VIDEOS: It's About Time (audio is pretty out-of-control fuzzy loud, sorry), Become The Enemy (love this from the new album, again watch the fuzz-audio), and a snippet of My Drug Buddy (which I think I may have been, uh, singing backup to as I filmed). Also very good were the renditions of Ride With Me and Rudderless, but I didn't get video. And he did Being Around, which you either love or hate, eh? 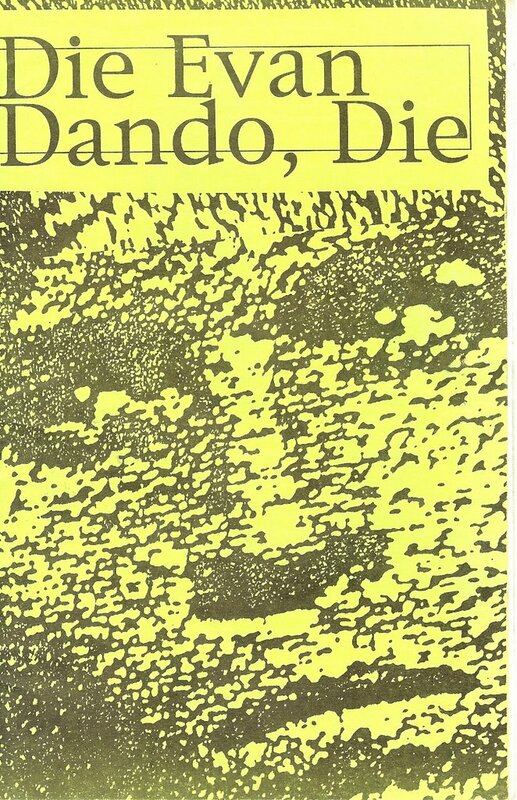 The impending concert date inspired me to go into the basement and open my box of high school ephemera in search of a little tongue-in-cheek zine I ordered back in the day called "Die Evan Dando, Die." At least I hope it's a joke. 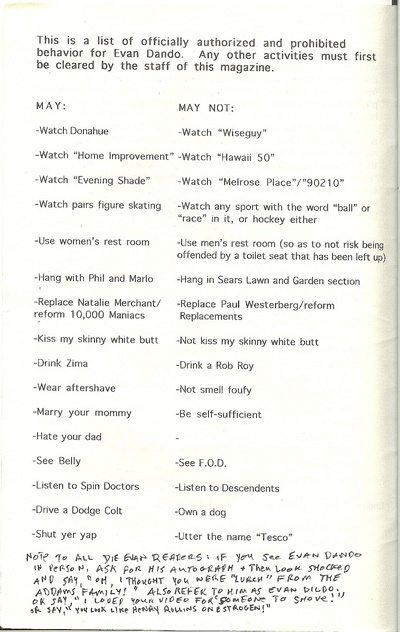 I think the author of this photocopied, hand-addressed bit of '90s lore was just jealous of Evan's sunny good looks, and annoyed with his sensitive-strummer persona. If I had gotten to talk with Evan (I didn't), I was considering asking him to sign it, but also a little worried that he'd think it was a bit scary (and me as well, by extension). So I think that maybe it worked out for the best for everyone involved that's he's a bit reclusive nowadays after shows. 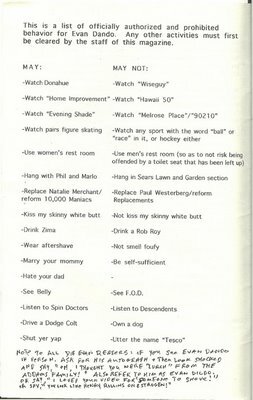 According to the scan, he can't listen to the Descendants? Ironic considering that half the Descendants members are his new backing band! into your arms = perfect. the dando is coming to visit me in two weeks. i totally should have stayed. He opened with Hannah & Gabbi? Sigh. One of my all time favorite songs. Ever! Great post. jesse, I'm pretty sure he started with Big Gay Heart, actually. 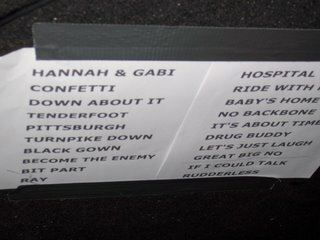 that setlist was moderately followed. We're practically the same person. I had a ticket to see this show in SLC last weekend, but decided to opt out at the last minute. Glad you enjoyed! duet on 'miss world' and 'doll parts'. 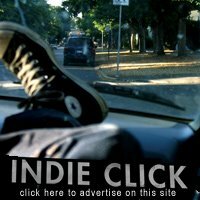 so, i redid my blog. just because i was up really late. i alterd the banner i made for you, i feel kinda bad, but you wern't using it and i didn't want all the hard work and time i spent on it go to waste. but please tell me what you think of my new design. hope you forgive me! Nice work on the L-heads, Heather: thanks!